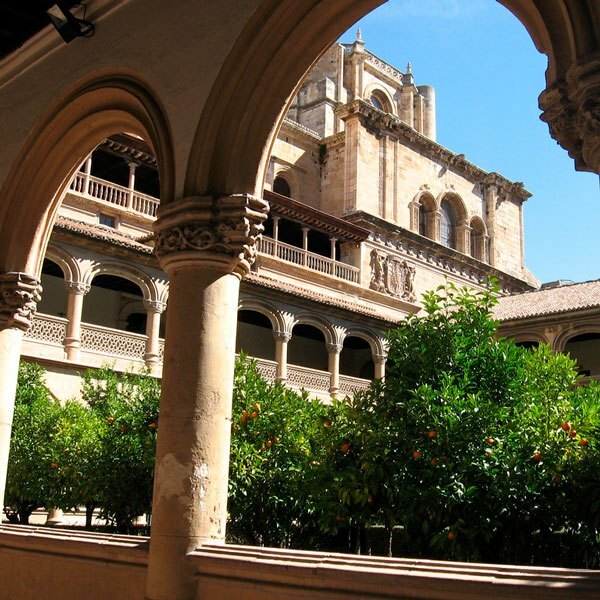 The monastery was build at the beginning of the 16th century with donations of Gonzalo Fernandez de Córdoba, the Great Captain, and his wife Doña María Manrique, duchess of Sessa. The ordered the famous architect Diego de Siloé and the sculptor Jacobo Florentino to design the building and ad the overwhelming iconographic cycle of images in the main altar exceeding the splendour of the Royal Chapel. However at the beginning of the 19th century the avatars of the Napoleonic invasion, the building lost its great splendour. Lots of materials and objects of the High Altar where looted. That is when also it loses its superb organs and the grating of the transept. But even afterwards it will also suffer in the subsequent confiscations of the state. After the restoration it became an impressive church again as you will see. Don Gonzalo Fernandez de Cordoba had an innovative mentality of military strategist and succeeded in defeating France in Italy, during decisive battles for the Spanish Crown. That is why he was named The Great Captain in the late 15th century. Doña María and Don Gonzalo were buried within this monastery, but are they still here? Do you want to know more about the figure of the Great Captain and his family? What happened with all their banners and trophies? Where is his famous sword? What about the invoice presented by the Great Captain to the King: “Between picks, shovels and hoes, one hundred million”. This and much more we will explain you on this very special Route of the Unusual Granada.